Flutter Magazine’s portrait of Dan Fingerhut, shared here with permission. I’ve had Dan Fingerhut of Philadelphia on my radar for a few years and now that my youngest son is a college student in Philly, I added Dan to my wish list of people to connect with during a mom-visit. Lucky for me, that occurred in September. 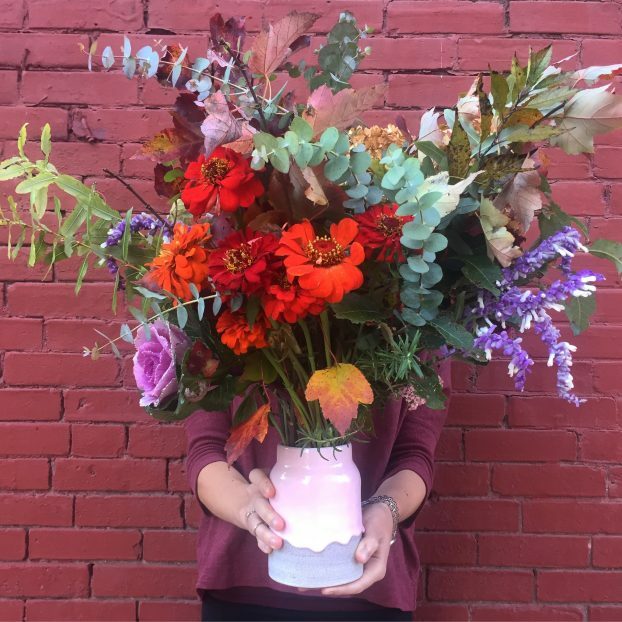 Between shopping visits to Target and Ikea for apartment supplies, I snuck away from the campus scene to spend a morning with this inventive floral designer. 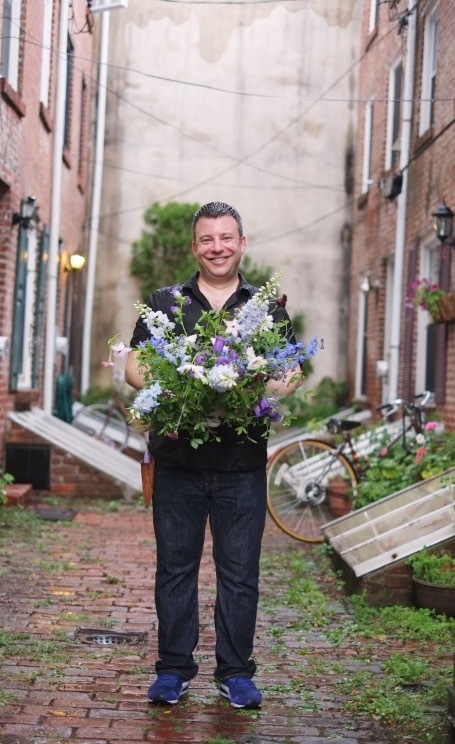 Dan Fingerhut is the creator of a busy little floral studio called Floradelphia. Every bouquet he creates dazzles the senses with scent and soul. As you will hear in our conversation, recorded at his postage stamp of a studio that he sublets from a hip art gallery just outside the Center City district, Dan got his start in flowers by wandering Philadelphia’s farmers markets. 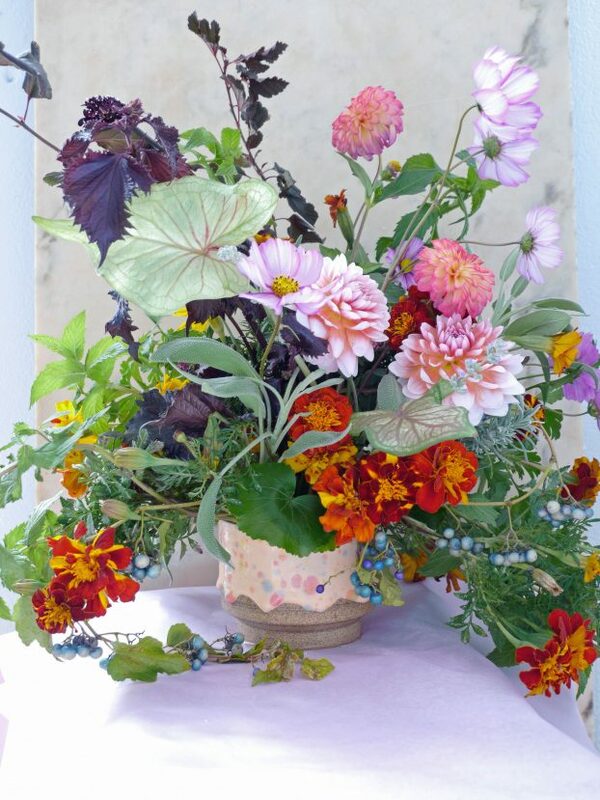 He was able to source gorgeous flowers but found it challenging to find foliage he liked, so he improvised with scented herbs and became hooked. As a child, Dan could be found in bright sneakers and a paper crown, smelling the flowers, and imagining everyone living joyfully in a more flowered world. Floradelphia, the name says it all. Flowers for Philadelphia! 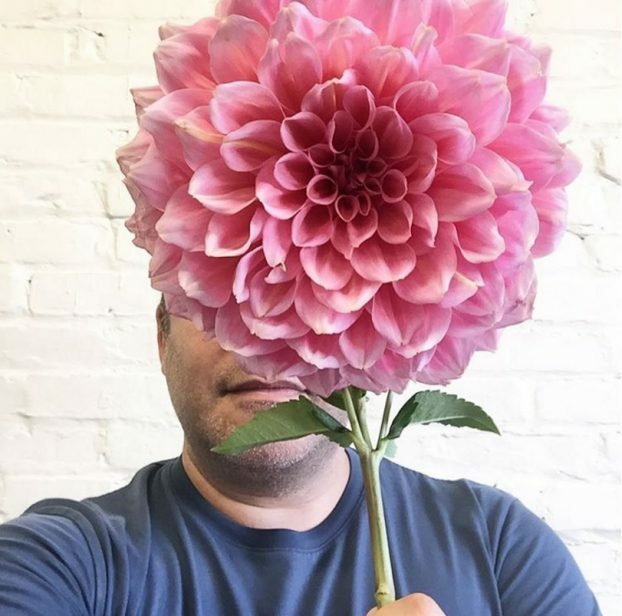 Dan poses with a dahlia at the peak of season. One of the larger bouquets designed by Dan for local delivery. The vase is locally made by potter Brian Giniewski, whose work Dan promotes and sells. Today that’s what he’s driven to create for all of his clients. 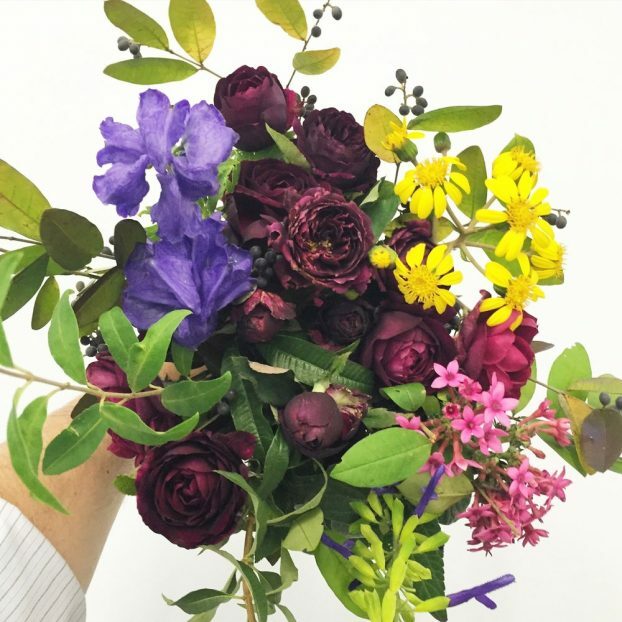 Floradelphia is for everyone who loves fragrance and color; wants a fresh, organic and happy aesthetic; desires local and seasonal ingredients; and values thoughtful, personal service. The studio also teaches floral design and takes a limited number of weddings and events each year, booking up quickly. According to Dan, Floradelphia is the first in Philadelphia to offer online delivery of local flowers. His flowers, herbs and vase arrangements provide an energizing, joyful, and fully sensory experience for the aesthetically oriented and eco-minded Philadelphia customer, including flower lovers, gardeners, nature enthusiasts, foodies, chefs, design lovers, aromatherapy and fragrance connoisseurs, and everyone who seeks wonderful flowers. I snapped these photos in September when I spent a morning with Dan Fingerhut and followed him to one of the urban farms that supplies his bouquets. Dan often gathers his arrangements in a locally-made vessel by potter Brian Giniewski. The artist’s Drip Pots are handmade in Philadelphia. The glossy glazes contrast with the grainy, matte finish of each vessel’s body. The glaze has been developed to melt in a particular way so that the drips can be ‘frozen’ at the perfect time during the firing process. 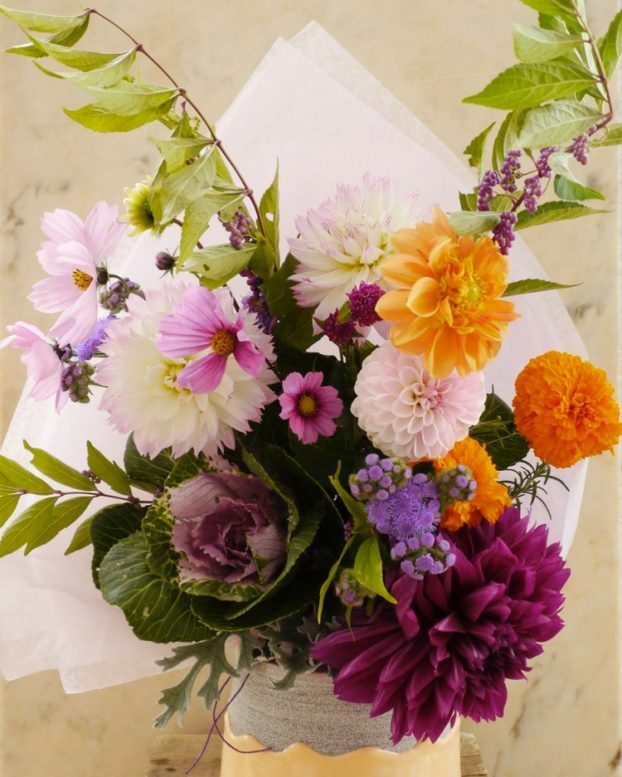 Flowers, herbs, and succulents are sourced locally, grown sustainably, and change with the seasons. 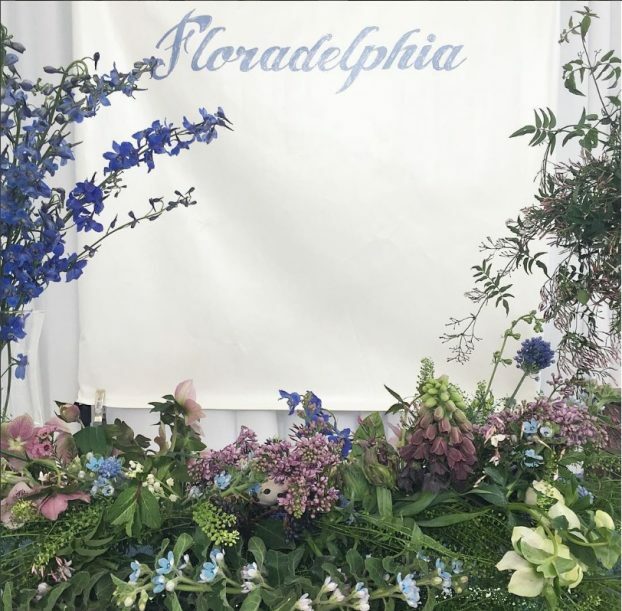 Martha Stewart Living named Floradelphia one of the top floral designers to book for your wedding, BuzzFeed called its arrangement “basically works of art”, and Design Sponge recommended Floradelphia as a florist to follow on Instagram. 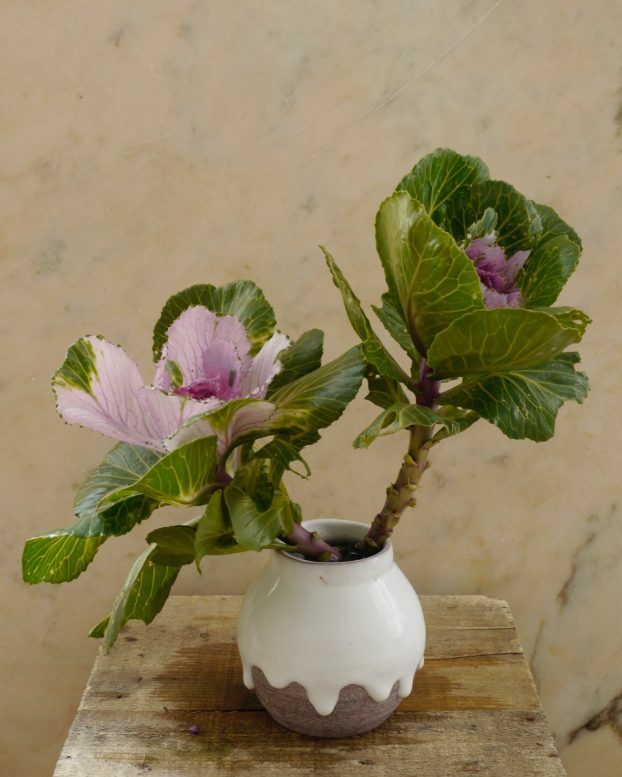 A whimsical arrangement featuring Brian Giniewski pottery and local ornamental cabbage. Thanks for joining today’s conversation! Be sure to view our show notes to meet Dan Fingerhut, see photos of his work, and follow along at his social places. The Slow Flowers Podcast has been downloaded more than 130,500 times by listeners like you. THANK YOU to each one of you for downloading, listening, commenting and sharing. It means so much. This entry was posted on Wednesday, November 16th, 2016 at 11:12 am	and is filed under American Grown, Blog Posts, Creativity, Entertainment, floral design, Flower Farming, Gardening, General, Plants, Playfulness, Podcast Episodes, SLOW FLOWERS Podcast, Slowflowers.com the Directory of American Flowers, Writing. You can follow any responses to this entry through the RSS 2.0 feed. You can leave a response, or trackback from your own site.